Platinum Resistance Thermometers operate on the principle that the electrical resistance of a metal conductor changes as a function of temperature. PRT’s provide an accurate, stable and repeatable means of absolute temperature measurement. The accuracy of a PRT may be independent of the distances between the sensor and the instrument whether it be an indicator, recorder, controller, data logger or computer. Copper hook-up wire is generally used between the sensor and instrument. Marlin PRT probes consist of a platinum resistance element that is encapsulated and circuited in a mineral insulated, metal sheath construction and terminated by means of bare wire, quick connectors or terminal heads. This construction provides a rugged probe that is moisture, pressure, shock and vibration resistant and also is bendable up to the element area. The conditions of measurement determine the type of PRT used. Temperature, atmosphere, protection, response, and service life should be considered. The following descriptions serve as a guide to selection. Select the PRT element that will be capable of operating in your application range. The reference resistance (100 Ohms@0°C – typical) and temperature coefficient (Alpha of 0.00385 – typical) must match the instrumentation in your system. Wire wound elements consist of fine, high purity platinum wire wound and imbedded in an insulation. The compacted MgO insulated construction of standard Marlin PRT’s provides maximum durability and dependability for industrial PRT applications. All elements are carefully annealed and mounted so that the sensing wire remains strain free under severe, heavy-duty applications. Each element will have its own characteristics and therefore each PRT must be tested to insure it is within tolerance. Single Element PRT’s are most commonly used but dual units are available for simultaneous recording, controlling and indicating of a single thermal point. Also, higher resistances are available but it should be noted that resistances above 100 Ohms and multiple elements require larger probe diameters (minimum 0.250″) and are more expensive. The C constant is used only for temperatures below 0°C. For all temperatures above 0°C, the C constant is set equal to zero, and the last term of the expression may be ignored. The amperage is limited by self-heating. Currents in excess of 10 mA through the elements are not recommended. The error caused by self-heating is typically less than 0.1°C temperature rise in water for a 5 mA current. Negligible for common AC use. After 10 cycles to high temperature limits is less than the adjustmenterror for the corresponding tolerance class. R100 – R0 (Ohms) / 100 x R0(Ohms °C) and is related to A & B by the expression alpha = A + 100B, where alpha = 0.00385 for P1. A range of limits of error elements are available (0.1% – typical). In general the better the tolerance the more expensive the thermometer. 1. The offset of its actual resistance from the nominal value (typically 100 ohms) at some reference temperature (usually 0°C). 2. Variation from a nominal value of the effective resistance temperature coefficient over a given temperature interval, giving rise to an additional error component that is proportional to the temperature. Both of these factors are variable from sensor to sensor, but their magnitude limits are implicit for a given tolerance ‘class’. 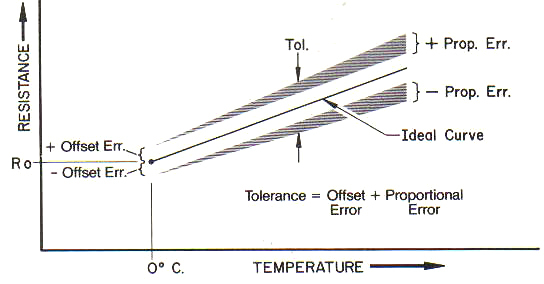 The designation of a PRT tolerance class is based on the percent allowable variation, in ohms, of the nominal resistance value at the reference temperature. However, for convenience, this ohmic tolerance is often expressed as an equivalent °C temperature variation. To this base uncertainty must be added the allowable proportional error for the class, which is stated as a percentage of measured temperature. This percentage applies when temperatures are expressed in degrees Celsius. A tolerance in degrees Fahrenheit is obtained by multiplying the Celsius equivalent sum temperature tolerance by 9/5. Resistance bridge techniques are used with resistance thermometers for temperature measurement. In these techniques the resistance change with temperature of the PRT, which is the basis for a resistance thermometer, can be affected by the lead resistance. marlin offers various circuits to fulfill the requirements of your instrumentation. The accuracy of a PRT may be independent of the distances between the sensor and the instrument whether it be an indicator, recorder, controller, data logger or computer. See instruments page for more information. The distance may vary from a few inches to many miles. Copper hook-up wire is generally used between the sensor and instrument. The comparatively high signal level of the PRT eliminates the need for high gain amplifiers and generally reduces the susceptibility of the measuring system to noise and signal interference. NOTES: Dual element PRT's require 0.250" O.D. minimum sheath diameter. Select a sheath alloy that will withstand the temperature and possible corrosives of your application. A 316SS sheath is standard. 316 Stainless Steel (16% Chromium – 10% Nickel) is a material that has superior corrosion resistance as compared to 304 Stainless Steel, with improved oxidation resistance and a higher hot strength. Maximum operating temperature is 927 °C (1700 °F). Inconel* 600 (72% Nickel – 17% Chromium) is a material that has outstanding resistance to oxidation, corrosion and scaling. Should not be used in the presence of sulfur above 1600 °F. Maximum operating temperature is 1149 °C (2100 °F). Use the probe diameter that will withstand the rigors of your application but with minimal affect on it. Because the element can be broken if the sheath is bent in the element area, it is recommended that a minimum of 0.187″ diameter thermometer be used. Smaller diameters are available on request. Your application dictates the size of the PRT Probe to be used. Generally the smaller the diameter the faster the thermal response time and the shorter the necessary immersion length for accurate instrumentation, but with less strength than a probe with a larger diameter. Use the sheath size that will withstand the rigors of your application but with minimal effect on it. Because the element can be broken if the sheath is bent in the element area it is recommended that a minimum of 0.187″ diameter thermometer be used. Small diameters are available on request. Compression fittings field positionable setting of the immersion length of the PRT. Standard fittings are stainless steel, 1/8 NPT or 1/4 NPT thread size, and are supplied with metal ferrules that are not relocatable after compression. Teflon Ferrules allow relocation after compression but have a limited temperature and pressure range. lava ferrules are crushed with compression and must be replaced if the PRT is removed or readjusted. Fixed fittings are stainless steel, NPT thread sizes, and are brazed to the sheath. Additional sizes, materials and welded mountings are also available. Fixed double fittings (Back to Back Threads) are stainless steel, NPT thread sizes, and are brazed to the sheath. Generally used with terminal heads. This arrangement provides a process connection.